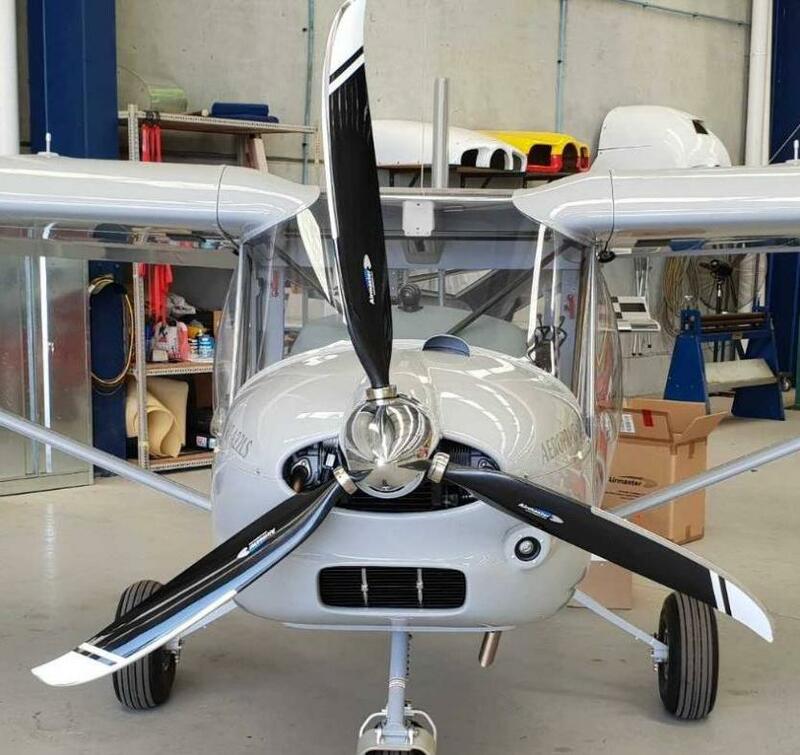 For the last 45 flying hours, we have been evaluating an Airmaster electric constant speed propeller on our Aeroprakt A22LS Foxbat demonstrator and comparing it with the standard on-ground adjustable 3-blade KievProp. For those of you not familiar with the New Zealand manufactured Airmaster prop, it is a superbly made and easy to use piece of kit. This particular example was retro-fitted after the aircraft arrived in Australia and installation was straightforward. It is a Rotax mandatory requirement that a manifold pressure gauge is fitted with a constant speed propeller, so this was included too. After discussion with Airmaster, the prop was fitted with three WWR70Z Whirlwind blades, with an overall diameter of 1775mm (about 70″). 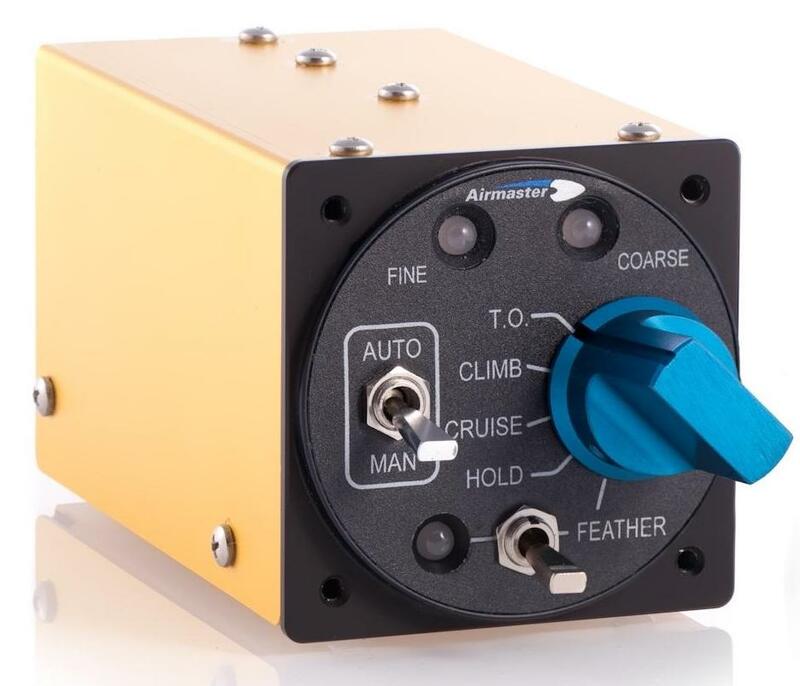 In normal use the system is very simple to operate – when you’re lined up on the runway, ensure you’ve set the switch to ‘Auto’ and dialled up ‘Take-off’ and apply full power. The engine revs to its 5800 redline and the aircraft takes off like a scalded cat! At about 200 feet above ground, still on full power, rotate the dial to ‘Climb’ and the RPM drops back to 5500, the maximum continuous RPM for the 912ULS. Finally, when you are ready, dial in ‘Cruise’ and throttle back as needed. At altitudes below about 2500 feet we tended to adjust the ‘Cruise’ throttle to give about 25-26 inches of manifold pressure at 5000 RPM. As an additional piece of information, we checked the static thrust of the Airmaster propeller at full throttle and 5800 RPM, using a calibrated strain gauge, and compared it with the standard KievProp at the same static full throttle RPM. At 5800 RPM on full throttle, the Airmaster developed around 200-205 kilograms of static thrust, compared with about 195-200 kilos from the KievProp. When you take into account that the Airmaster prop is about 12.5 kilos heavier than the KievProp, at these RPMs and power settings, the props were in effect generating about the same thrust per kilo of aircraft weight. In comparison with the KievProp, the Airmaster gave similar take-off distances and climb rates, although the KievProp had a slight edge above 200 feet, as it remained at 5800 RPM compared with the Airmaster 5500 ‘Climb’ setting. Rotax allows a maximum of 5 minutes running at 5800 RPM, so if you’re in a hurry, you can leave the prop/engine running at this speed. For both the Airmaster and KievProp, 5 minutes at 5800 RPM will get you well over 5000 feet above your take-off point! When joining the circuit for landing, we reduced power and changed the prop setting in stages – ‘Cruise’ around the middle of downwind, ‘Climb’ at the start of base and ‘Take-off’ somewhere down final approach, so that full power was available in the event of a go-around. The Airmaster gave a noticeable ‘airbrake’ effect when moved to fully fine pitch, increasing the descent angle. Similarly, in the event of an engine out glide, it would be a good idea to set the prop full coarse (or even feather it) with the manual setting, to reduce drag from the stopped or windmilling prop. The main differences come out at the ‘Cruise’ setting of 5000 RPM. At this setting the Airmaster gave a steady 95+ knots True Air Speed (TAS) – we are lucky enough to have a Dynon D10A on our panel, which shows TAS. The fixed (on-ground adjustable) KievProp set to give 5800 RPM on take-off could only manage around 80+ knots in the cruise at 5000 RPM. However, when set to the factory recommended pitch (giving about 5100 RPM on take-off) the KievProp will at least match the Airmaster cruise speed at 5000 RPM, although take-off and climb will not be quite as spectacular. And there you have it in a nutshell – the Airmaster will give you great take-off performance and a good cruise speed in the same flight. The standard fixed-pitch KievProp you can achieve fantastic take-off performance or a good cruise speed, but not both in the same flight. However, the ‘factory’ setting will at least match (and maybe even exceed) the cruise speed of the Airmaster, albeit with a small dent in the take-off distance and climb out rate. Whether the Airmaster is worth losing around 12.5 kilos of load capacity and a cost of around A$13500 (about US$9750) including GSTax, installation and manifold gauge, is a question only each individual owner can answer.